The A149 has always played a significant role in my life. I would have first travelled along its winding path as, cradled in my parents arms, I made my way, via the old hospital in King’s Lynn, to my childhood home in Brancaster for the first time. It’s the road that would have been part of my daily journey to the two Norfolk schools and one college I attended as a child as well as the now very familiar route that took me to King’s Lynn station and the start of a new life in London. Trips to see the doctor, to church, to visit the many family members scattered along its route or nights out at one of a handful of glorious pubs and seaside towns and villages a’ plenty with the intent to explore, either on my own or with friends as well as a myriad of holiday jobs, they all involved a journey, long or short, along the A149. It’s the road my bride walked along to the village Church on our wedding day, that same road and Church I quietly walked for the funeral of my much loved and still missed Father some years later, he who would, endlessly and without complaint, give me lifts to and from all the places I visited on that stretch of highway we all call ‘the coast road’. In an ever changing life and a world that expects us all to grow up and move on rather more swiftly than we might like, it is and remains an absolute constant, a letter followed by three numbers that always reminds me that I am nearly home when I first see it appear on one of those garish green roadway signs that the Highways Agency are so fond of. Me and countless thousands of other people. One road. But so many journeys to be had and so many more yet to be taken. Our highway, our lives. This book is a road trip, my little homage to the A149. It features 75 landmarks along the way, either readily seen or hidden behind a Norfolk corner as you travel its 84 miles in a easterly direction from King’s Lynn towards Great Yarmouth. Some will be familiar whilst others will not whilst one of the locations featured no longer exists! There will also be some, I suspect, that you question the inclusion of, whilst others you will deem to have been unforgivingly omitted. 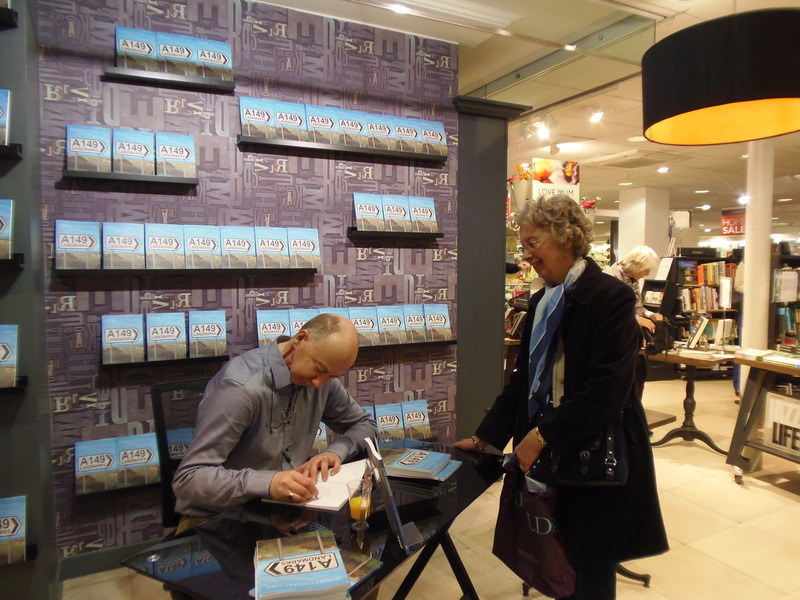 It is important to realise that this is a book to browse, to peruse in the hope that a fleeting mention, reference or photograph might encourage you to find out more about the place I have written about. The descriptions given should not be considered as definitive historical accounts of the places named but personal observations and musings mixed in with a few facts, some of which will almost certainly be apocryphal-and delightfully so. Historian I most certainly am not. What I am is a man constantly in love with all things Norfolk. Some of the places mentioned may not even be on the A149 itself but will require a detour from its sinuous route. Rest assured if that is the case, then the journey off track will be a short but worthwhile one to make. Enjoy your journey and some of these destinations you may stop at in order to take a closer look. Along the old coast road. The modern-day hamlet of Babingley is no more than a small group of houses scattered along the A149 around seven miles NE from Kings Lynn. Our interest here however, is that of the abandoned village which lies in fields to the west of the road, one marked by the ruins of St Felix’s parish church. Babingley is claimed to be the site where St Felix of Burgundy, the Apostle to the East Angles, landed in England in around AD 615, his arrival leading to an invitation from the areas ruling family to preach Christianity throughout the region. Popular legend supposes that Felix’s arrival at Babingley was more through accident than design, having come about as the result of his being shipwrecked on the river that shares the hamlets name. Felix, saved by a well-meaning colony of beavers, was so grateful for their mercies that he immediately consecrated one of the beavers as a bishop. This act is commemorated on the village sign which shows a grateful St Felix handing a bishop’s mitre to the beaver. 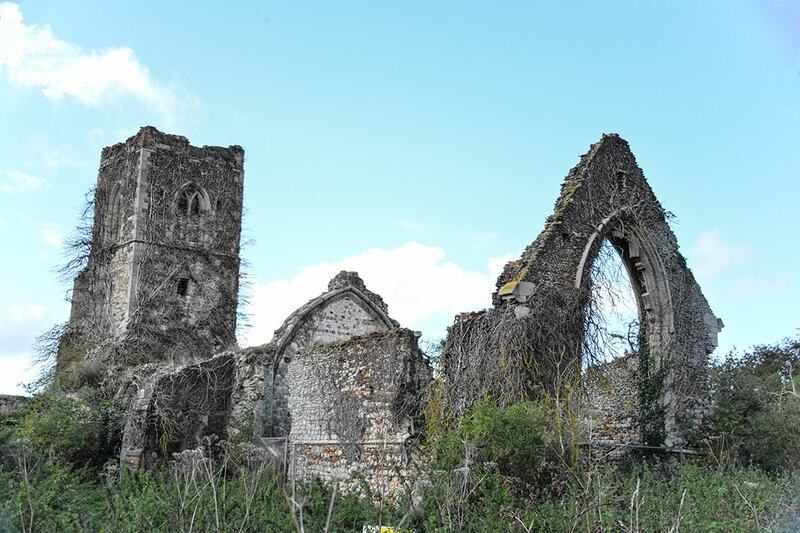 The ruins of the 14th century St Felix’s Parish Church are said to be on the site of the first Christian church to be built in Norfolk. It was regularly used for worship for nearly 500 years before falling into its current state of disrepair. The site is now part of the nearby Sandringham estate (see following page) and can only be accessed through the express permission of the landowner. The curious explorer might also want to look for Butler’s Cross. This is the base and broken shaft of a medieval stone boundary cross which is sited on a traffic island at the junction where the B1439 to West Newton meets the A149. Its name is derived from that of the de Botler family who held the manor of West Hall in Babingley from the mid-13th century.